Gabby’s headaches had started out small, but had gotten so severe that she asked to cancel her Teddy Bear birthday party. Instead of a party, she took a trip to the ER at Children’s Hospital Colorado, where a CAT scan revealed the source of the headaches. The day before her 5th birthday, Gabby was diagnosed with a brain tumor the size of a baseball. This was the beginning of a 19 month fight against this terrible disease. 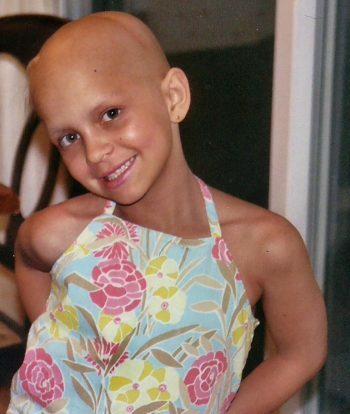 Gabby’s treatment started with an 8 hour surgery, followed by chemotherapy, more surgery, and radiation therapy. Every step of the way the doctors and nurses at Children’s encouraged Gabby to be a kid and do all the fun stuff a typical 5 year old should do. She spent the fall playing soccer, dancing, and enjoying kindergarten. Gabby’s tumors returned again in December and she then went through a stem cell harvest and transplant. Her treatments were long and hard, but the staff at Children’s continued to treat her like the silly little girl she was. Because of the stem cell rescues and the experimental therapies, Gabby’s quality of life remained good. She had a great summer swimming and playing tennis before the cancer returned again. On September 28th, 2004, Gabby passed away. The staff at Children’s never stopped calling and checking on her. Living through cancer is terrible. Watching a 6 year old fight the disease is heart breaking. Through the entire experience, we knew Gabby was in the best possible place. Children’s Colorado has the best and brightest of doctors and nurses who helped care for her while fighting this awful disease.